Two hours west of Havana, down a rutted dirt road and beyond the rusting gate, lies the humble secret to the mystique of Cuban cigars. This is Finca El Pinar Robaina, where the scion of the country’s most renowned tobacco family grows the delicate leaves wrapping smokes so prized that a group of Chinese millionaires once offered $800 apiece for them. These are hopeful times in the land of Cuban cigars. With relations between the U.S. and the island nation thawing, the industry is looking wistfully northward, to the $13 billion U.S. cigar market. In fact, on a January afternoon, the master of Finca El Pinar isn’t at home. Hirochi Robaina, son of socialist Cuba, is touring New York, world capital of capitalism. He’s there to praise a new line of Cuban-inspired cigars made from, of all things, Nicaraguan tobacco. These HR Sublimes can be had legally in the U.S. for a mere $21.95. His own Vegas Robaina Maestro cigars would go for as much as $35 each. But, unlike the Nicaraguan smokes, they can’t be imported because of the trade embargo President John F. Kennedy imposed on Cuba in 1962 — only after he stocked up with 1,200 of his favorite H. Upmann Petit Coronas. Robaina, 39, says he lent his family name to HR Sublimes to honor his late grandfather, Alejandro Robaina, Cuba’s most venerated tobacco grower. Of course, a little U.S. marketing of the name wouldn’t hurt his own habanos, should the embargo fall. Inside Nat Sherman, the legendary New York tobacconist just off Fifth Avenue, Robaina weaves through the crowd like a rock star. The air is thick with blue smoke. Robaina, an HR in one hand and a pen in the other, signs autographs. With a five-year visa in his passport, he has suddenly become a global ambassador for Cuban cigars. “It’s a nice promotion,” Robaina says, adding that the new cigars will help position his Cuban brand for when the embargo ends. He says he makes no money from the HR venture with Cubanacan Cigars of Coral Gables, Florida. For now, at least, that would be illegal. Few back in Cuba expect the cigar business to change overnight, even if the embargo disappears. In western Cuba, where the loose, red soil yields the most prized tobacco, time still moves to the familiar rhythms of planting, growing, reaping and curing. 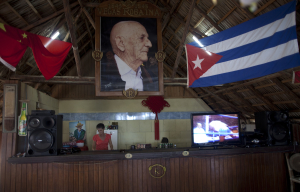 The industry is ultimately overseen by Cubatabaco, a state monopoly established after Fidel Castro nationalized virtually every aspect of economic life. Habanos SA, a joint venture between the government and Altadis SA of Spain, a subsidiary of Imperial Tobacco Group Plc of Britain, controls distribution worldwide. Still, expectations are high. At a cigar festival in Havana this week, Jorge Luis Fernandez Maique, commercial vice president of Habanos SA, told reporters that Cuba could capture as much as 30 percent of the U.S. market for premium cigars. Habanos posted sales of $439 million in 150 countries last year. Cigars, along with goods like rum and various services, could eventually help lift annual trade between the U.S. and Cuba to $12.6 billion, according to a study for the Peterson Institute for International Economics in Washington. The outright ban on cigars has already been relaxed: American visitors can now bring home $100 worth of the smokes for their own consumption. Robaina — whose grandfather was so revered he could refuse Fidel Castro’s request to put his 42 acres (17 hectares) into a state-run cooperative — said the Cuban government will start positioning for the new era. He predicts the state will allocate more land, distribute more seedlings and pay higher prices to encourage growers. “If the government gives me more land, I plant more,” said Robaina, whose family has been farming since 1845 in Pinar del Rio Province’s Vuelta Abajo region. Although premium cigars from places like the Dominican Republic, Nicaragua and Ecuador get high marks, Cubans have always enjoyed a special mystique. Luciano Pavarotti, among others, praised Alejandro Robaina for the quality of his leaves, which are dried at the family’s farm on long rows of wooden poles hung under a rusty, corrugated metal roof. 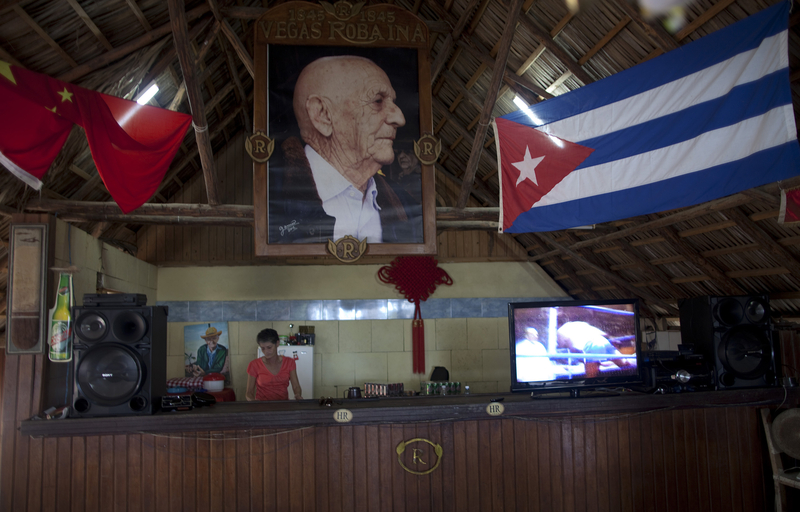 A museum in a two-room house at Finca El Pinar Robaina displays photos of Alejandro Robaina with Fidel Castro, Sting, and the granddaughter of Winston Churchill. In Havana, state-run manufacturers provide thousands of jobs. Tabacuba’s La Corona factory employs hundreds of moisteners, strippers, rollers, quality checkers and taste-testers. In one large room, 281 “torcedores” roll each cigar by hand, often while puffing away themselves. The most skilled travel the world to demonstrate their talents at cigar festivals. Cuba now exports 100 million premium cigars a year, making them a leading foreign currency earner for an economy where most people, as employees of the state, earn an average of $20 a month. The U.S. consumes three times that number of fine cigars, worth $2.5 billion. Materazzi doubts Cuban cigars can displace all the premium brands that are made in the Dominican Republic and Nicaragua today. Still, some small U.S. cigar makers say that imports from Cuba could drive them under. “Many American companies would go out of business because they don’t have the money to compete with the Cuban government,” said Jose “Pepe” Montagne, 50, the Cuban-born owner of Miami-based Guantanamera Cigar Co. The Cigar Association of America, which represents 70 percent of U.S. producers, says it’s watching what happens with the opening to Cuba and keeping quiet on the issue until its members meet to discuss strategy. Even if U.S. producers don’t lobby against the return of Cuban cigars to American shores, legal battles are likely over trademark claims. General Cigar Co. of Virginia sells premium cigars in the U.S. that are made in the Dominican Republic and Central America under storied brands including Cohiba, Partagas and Hoyo de Monterrey — some purchased from Cuban families who fled the revolution. In Cuba and elsewhere in the world, those names belong to the Cuban state, and Cuban-made cigars bearing those labels are distributed outside the U.S.
A court fight over Cohiba — a brand created in Cuba in 1966 for Fidel Castro, but trademarked in the U.S. by General Cigar in 1981 — has dragged on since 1997. General Cigar lost a round this week in the U.S. Supreme Court, though the case will continue before a patent and trademark appeals board. Dan Carr, chief operating officer of General Cigar and chairman of the Cigar Association of America, didn’t respond to requests for comment. If some Americans are reticent about possible trade conflicts, Europeans are unreserved in their enthusiasm for the Cuban product. Lounging on rattan sofas on the red-tiled terrace of the art deco Hotel Nacional de Cuba in Havana — where Frank Sinatra, Mickey Mantle and John Wayne were guests before the embargo — a handful of cigar importers from Belgium drew on their habanos at 10 o’clock on a recent morning. They reflected that no matter how good competitors have become, the best Cuban cigars are unique, comparable to the best French wines. Tony Hoevenaars, managing director of Cubacigar Benelux NV, the exclusive importer of habanos to Belgium, Luxembourg and Netherlands, said scaling up Cuba’s production from 100 million handmade cigars would take at least two years to grow more leaves. Training new rollers takes a minimum of nine months. Back at Nat Sherman in New York, Hirochi Robaina was asked what the end of the embargo would mean for his family. “Oh, it’s very, very important,” Robaina says. Yes, Cuba has European and Asian markets for its cigars. But the U.S., after all, is just 45 minutes away.